The deal with New York's department store John Wanamaker is an early sign of the huge success enjoyed by André Perugia in the Twenties. 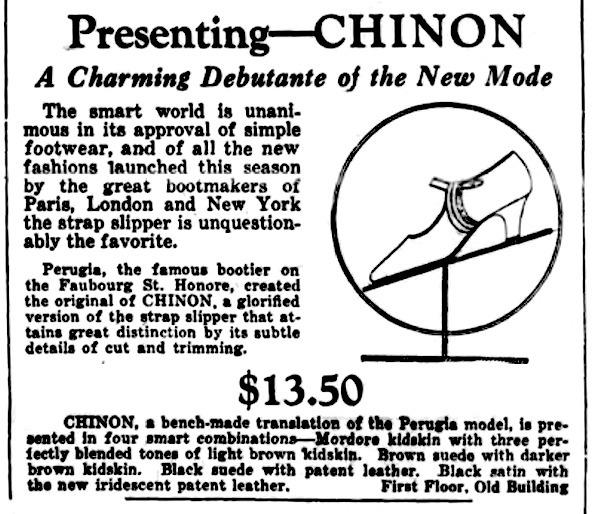 1922 | André Perugia's debut in New York? 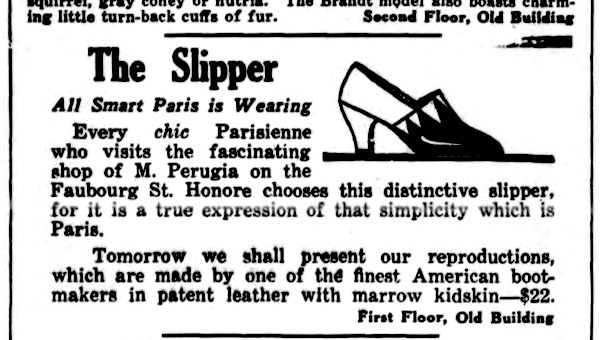 Perugia - the coming bootmaker of Paris - made the original, a charming new interpretation, in patent leather, of the close-fitting ankle-length slipper, with an entirely new idea for the piece over the instep. We copied it exact in every subtlety of line, but using, in place of the original parallel lines of gray across the front, slender insets of buckskin in a soft shade of one of the modish tones between gray and brown. A few pairs are in stock now for showing and for ordering. The full line will be here early next week. A few weeks after the first advertisement, a follow up informed the customers that a Wanamaker representative, who just got back from France, has been informed that Madame Perugia selected this very model as her favorite, here below from the collection of the Musée International de la Chaussure de Romans. 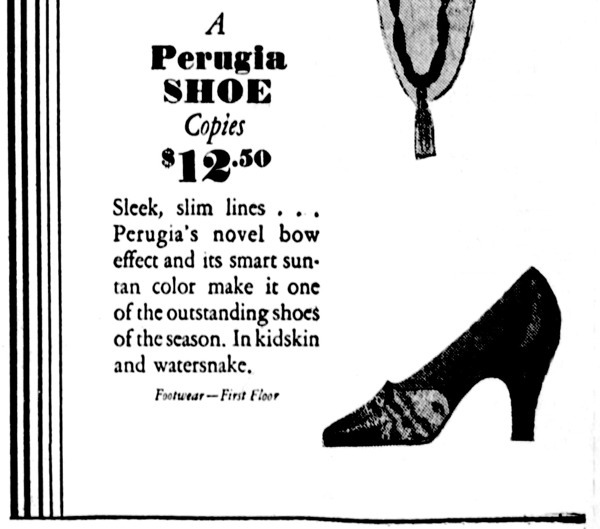 The shoes, faithfully copied after Perugia in the finest brown kidskin, have smartly rounded toes, light turned soles and demi-French heels. The dark polished buckles of finest Italian and American walnut are beautifully carved and shaped to fit the instep. These may be purchased separately at $ 2,50 a pair. 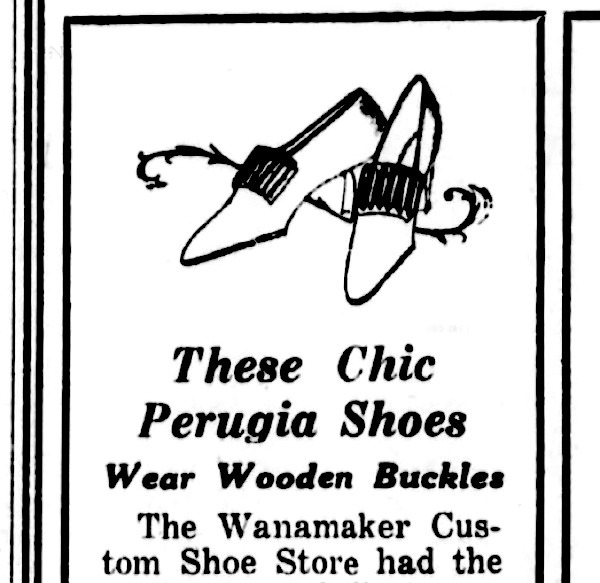 The Perugia-Wanamaker deal came to an end in 1925 as the 40-plus-year-long business relationship with I. Miller was about to start (1926 - The Euclid Pump). Still, legit (?) 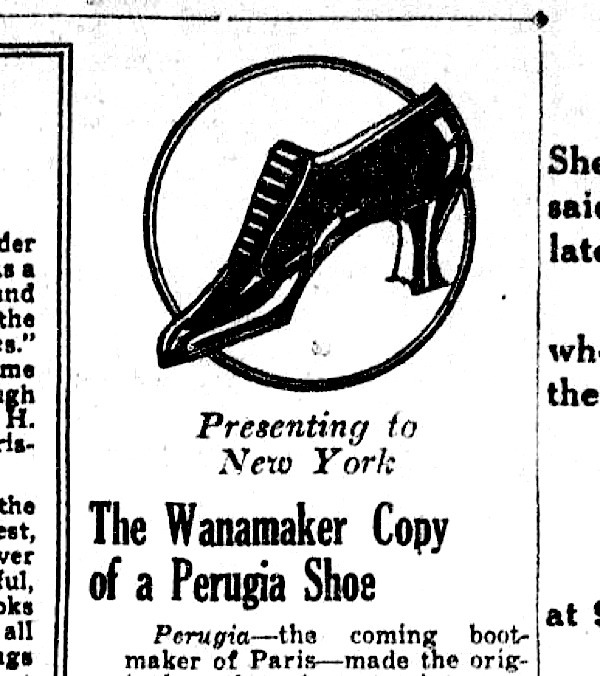 Perugia copies appeared every once in while like the one at Brooklyn's Loeser's (March 1929). Fashion-wise, the copies-phenomenon as a whole lasted until the Fifties when the New World stopped looking at the Old World with reverence. Or better, legit copies stopped, but knockoffs still existed, only they did't pay royalties anymore. Nowadays the situation is no different and copies even got praised by costume and fashion journalists alike: brands - being advertisers - help enormously erasing the memory cells.